This geometric print dress makes Jennifer Hudson look like a million bucks. 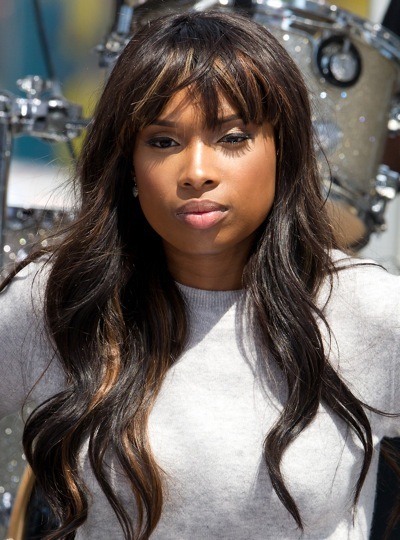 Jennifer Hudson adds some blonde highlights to illuminate her bangs. Jennifer Hudson’s striking blue leggings add a pop of color to her casual outfit. Jennifer Hudson shines in her LBD. 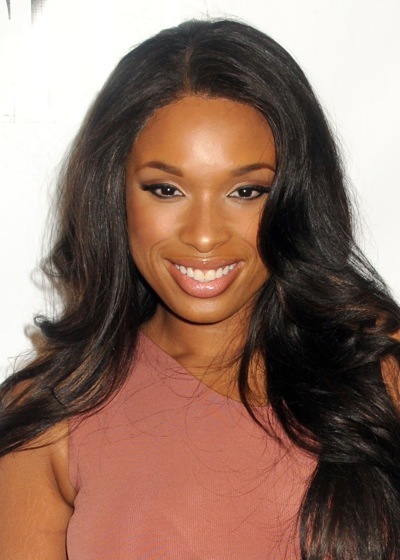 Jennifer Hudson adds light brown tips to her black hair for some added warmth. 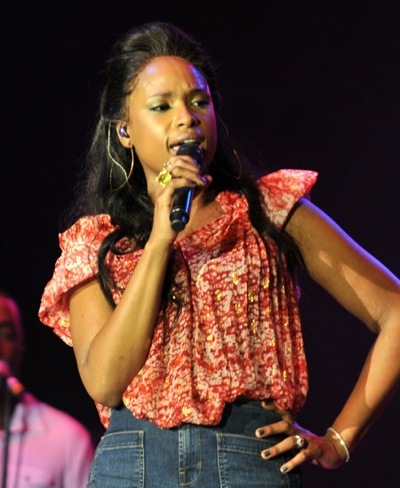 The patent leather belt accentuates Jennifer Hudson’s waistline. This red mini and silver shoes show Jennifer Hudson’s unique style. Jennifer Hudson sweeps her hair to the side in big curls. 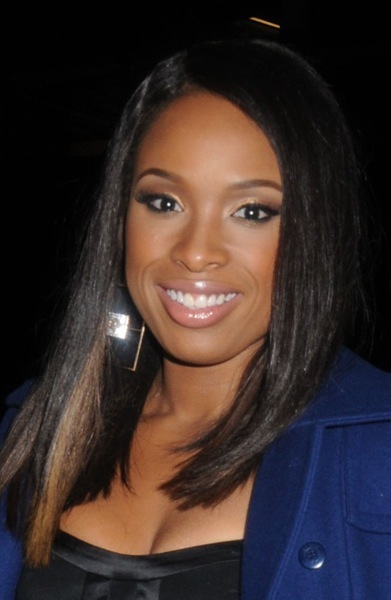 Jennifer Hudson shows off her bangs and long wavy curls. Jennifer Hudson goes for a simple black and white combination as she takes the stage. This denim mini dress compliments Jennifer Hudson’s long legs. The sheer insets on the sleeves of Jennifer Hudson’s dress give the top a peasant feel. Jennifer Hudson covers up in a grey hooded wrap. The metallic threads in Jennifer Hudson’s skirt add a touch of contrast. Jennifer Hudson chooses a full evening gown for this red carpet event. Jennifer Hudson take her mini-babydoll dress to the streets of NYC. Jennifer Hudson wears a dark green jumpsuit for a casual night on the town. This form fitting salmon dress shows off all of Jennifer Hudson’s fabulous curves. Jennifer Hudson wears flats with this long dress for a comfortable look. Jennifer Hudson frames her face with large curls. Jennifer Hudson layers a striped shirt and black skirt with black tights to achieve this look. Jennifer Hudson wears a fedora to add a youthful edge to her look. Jennifer Hudson wears a mid-length form fitting black dress to this awards show. Jennifer Hudson looks radiant in this striped mini dress. Jennifer Hudson covers her black dress with a leather blazer for a bit of edge. Jennifer Hudson pairs metallic pumps with shorts to accentuate her long legs. Jennifer Hudson adds a splash of electric blue to eye makeup to brighten her outfit. 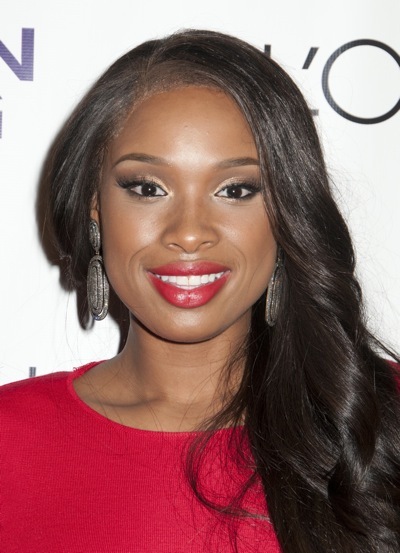 Jennifer Hudson wears her hair in a side braid for a quick and easy look. Jennifer Hudson wears tights under her shorts to bring a fall look to a summer style. The vertical lines on this long sleeve dress elongates Jennifer Hudson’s body. 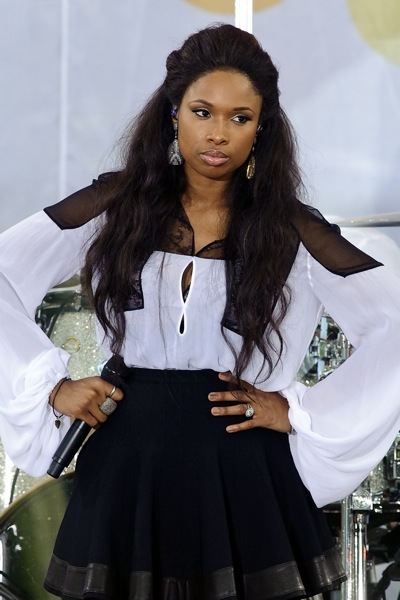 Jennifer Hudson’s pulled back bangs accentuate her peasant top. Wearing a knit cap keeps Jennifer Hudson warm and stylish in the winter months. Jennifer Hudson covers up with a maxi knit sweater. Pairing a black blazer with regular blue jeans dress up Jennifer Hudson’s casual style. Jennifer Hudson stays warm in the winter with a buble knit jacket. This orange halter dress shows off Jennifer Hudson’s slim shoulders. This asymmetric updo shows off Jennifer Hudson’s elegant features. Jennifer Hudson looks spectacular in this purple v-neck dress. This bi-level hem makes Jennifer Hudson stand out at the Grammy Awards. 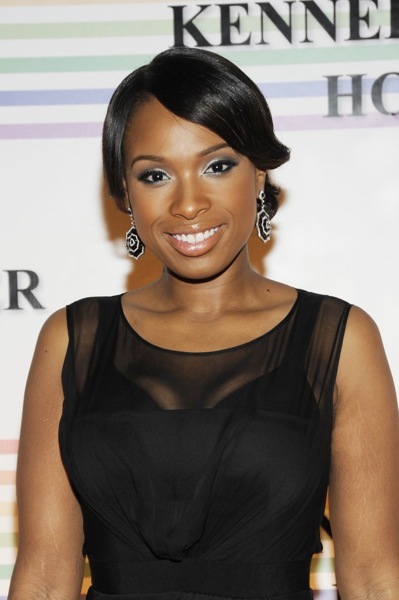 The rosette diamond earrings pair nicely with Jennifer Hudson’s black dress. The sheer neckline of Jennifer Hudson’s black dress adds an individual touch. Jennifer Hudson layers herself in comfortable clothes for a day at the airport. This red wrap dress highlights Jennifer Hudson’s personal style. This blue one-piece jumpsuit stands out against Jennifer Hudson’s black booties. Jennifer Hudson’s bold cuff adds an artsy element to her black dress. This front-tie grey dress shows the simple elegance of Jennifer Hudson.